Final-year IITM student Richard Morter appeared as a guest on the latest episode of Oxford College Castaway, a programme on the University radio station Oxide Radio. The show takes its inspiration from the longstanding BBC Radio 4 series Desert Island Disks. During the hour-long interview Richard talks through some current topics in malaria and global health, as well as describing some of his own research on malaria vaccines. He also discusses life in research and in Oxford more generally. In the spirit of Desert Island Disks, he also chooses some of his favourite tracks which are played throughout the interview. You can also find all the previous episodes of Oxford College Castaway, here. Doctoral training programs can be draining, physically as well as mentally. The constant pressure of the scientific world and self-expectations may in particular impact on students’ well-being. Recent reports as published in Nature Biotechnology estimate that close to a third of all doctoral student are struggling with mental illnesses during their studies. (1) Therefore, the question of how to care of someone’s mental health during the PhD needs to be addressed. In the IITM program, students (spear-headed by the fourth-year student Hannah Behrens) and the program administration decided to dedicate a day to this topic and held their first mental health awareness workshop in mid-January. The workshop, which was held by a facilitator from “Oxfordshire Mind”, aimed to improve the general understanding of mental health, provide new ideas of how to look after mental health and provide information about the support systems that can be found in and around Oxford. IITM students awaiting the start of the Mental Health Awareness workshop hosted by Oxfordshire Mind. Despite the fact that the workshop was only mandatory for first- and second-year students, close to every student enrolled in the program participated and appreciated learning about mental distress and how to prevent it. Working in groups and together with everyone in a private and secure environment broke the silence surrounding mental health issues very quickly. The workshop was a great starting bringing mental health into focus and was well perceived by all students. This event shall not remain the last of its kind. In future, awareness workshops are likely to become part of the toolkit of newly incoming IITM students. Additionally, plans to further student mental health support through student-to-student peer support underlines the dedication of the IITM program for this topic. If you are struggling with mental health find more information about the local services following this link. This September, the administration of the Wellcome Trust Infection, Immunology and Translation Medicine (IITM) programme hosted a new symposium; the IITM Perspectives Meeting. The symposium is open to students and staff from around Oxford and aims to provide insights into state-of-the-art research areas relevant to the IITM program. This year’s symposium highlighted the impressive developments in ‘biologics as therapeutics’. The day was kicked off by Emeritus Prof. Herman Waldmann sharing his long career insights in developing one of the first monoclonal antibody treatments. Starting from studies, several decades ago, his monoclonal antibody CAMPATH-1 went through several phases of in vitro and in vivo testing to become a therapeutic for leukaemia, lymphoma and transplant rejection. This was not an easy journey, as Waldmann described during his talk, which included struggles with pharmaceutical companies and a resilient belief in his therapeutic. After setting the historic scene, Dr. Mariagrazia Pizza who is currently working as senior scientific director for GlaxoSmithKline, presented more recent advancements in vaccinology. She talked about novel strategies to develop new adjuvants and therapeutic vaccines against bacterial infections such as Neisseria meningitidis. Following Dr. Pizza, the new director of the medical science division Prof. Gavin Screaton offered new insights into the cross-reactivity of the immune system to dengue and Zika infection. His research revealed new potential antibody targets to fight dengue and Zika virus infections. The morning session was then closed by Dr. Shaun Cordoba, director of synthetic biology at Autolus Therapeutics, where he works to modify T cell responses using engineered T cell receptors on their surface. His research could provide new avenues to treat cancer more specifically and effectively. The afternoon began with a panel discussion focussing on the requirements and funding opportunities for translational research approaches. Experts from venture capital firms, such as former Oxford student Bonnie van Wilgenburg, and major research funding agencies represented by Prof. Sara Marshall of the Wellcome Trust and Adam Baggs from the Medical Research Council discussed the (mostly) pros and (fewer) cons of translational research and the integration of academic and industry research. Giving another aspect to the field of ‘biologics as therapeutics’, Dr. Kerry Fisher (CSO at PsiOxus Therapeutics) presented his astounding research on oncolytic viruses. He showed how working in a university setting may be profitable to companies. The last session of the day was concluded by Dr. Ausra Razanskiene (Scientific Manager at Nomads) and Prof. Richard Pleass (Liverpool University) who presented their research on plant-expressed antimicrobials and antibody glycolysation, respectively. Dr. Razanskiene’s research may provide new large-scale methods to produce cost-effective antimicrobials to fight Pseudomonas, a common pulmonary opportunistic pathogen. In contrast, Prof. Pleass’ research found that the glycosylation of the N-terminal hinge region of antibodies is an important for their multimerization. After some concluding remarks of the IITM program director Chris Tang, speakers and IITM students could further mingle during a delicious dinner at St. Edmund Hall. After a very successful day with about 100 attendees and great presentations and discussion, we are delighted to say this symposium will be a biennial event and return to Oxford in 2020. So, stay tuned for more cutting edge infection, immunology & translational medicine. The IITM course is delighted to welcome Professor Nicole Zitzmann and Professor Jan Rehwinkel as the new co-directors. Both are established PIs on the course, and both currently have IITM students working in their labs. We are looking forward to working with Nicole and Jan over the forthcoming years, and anticipate their expert input into this course. They are taking over the role from Professor Helen McShane, who we wish all the best in her new role as Director of the Oxford Biomedical Research Centre. Richard Wheeler is going to become the first IITM graduate to establish his own lab. During his DPhil, which he spent under joint supervision of Keith Gull and Eva Gluenz, Richard studied the cell shape of Trypanosoma and Leishmania parasites and how their shape affects their ability to swim. Now, six years after his graduation from the IITM program, Richard was awarded with the Wellcome Trust ‘Sir Henry Dale Fellowship’ allowing him secure funding for at least 5 years to establish his own research group. His new research group will be a continuation of his previous experiences and concentrate on Leishmania parasites. In particular, they will research how the parasites control swimming and how this is important in the life cycle of the parasite. Coming from a biochemical and cell biological background, he wants to put a stronger focus on the medical applications of his research while still drawing on the interdisciplinary opportunities on South Parks Road. Therefore, Richard will move with his lab to the Peter Medawar Building for Pathogen Research. Richard will start to advertise for post-doctoral and PhD positions in the near future, but he will be happy to hear from anyone interested in parasite cell biology, microscopy and automated image analysis. You will also find Richard’s group online, a ‘beta’ website at: wheelerlab.net. Congratulations to Professor Helen McShane, who has been appointed the new director of the Oxford Biomedical Research Centre (BRC). Helen has been a supervisor on the IITM programme since it began and became co-director in 2016. She will now also take on leadership of the BRC from Professor Keith Channon, who leaves to become deputy director for research of the Medical Sciences Division. The Oxford BRC supports a research partnership between Oxford University Hospitals (OUH) NHS Foundation Trust and the University of Oxford. Since 2007, it has secured funding in excess of £260m to support translational ‘bench-to-bedside’ research projects. The partnership combines the scientific and clinical expertise available at the University and OUH to accelerate the translation of basic scientific findings into therapeutic and interventional products which yield clinical benefits for patients. Translational medicine is a primary focus of the IITM programme. Helen’s appointment to lead one of the largest translational medicine programmes in the country reinforces this. Opportunities to conduct translational medical research through the IITM programme are available with supervisors based in the Peter Medawar Building for Pathogen Research, the Oxford Vaccine Group, the University’s major overseas programmes in Thailand, Vietnam and Kenya as well as the Jenner Institute, where Helen herself is based. More information on the Oxford BRC and Helen’s appointment, can be found on their website, available here. When Ian led me into the newsroom on my first day, I was overwhelmed with excitement. The newsroom is a large, modern office with huge glass windows and rows upon rows of desks. It was somewhat messier and noisier than I had anticipated, with old books and newspapers piled up on the desks and journalists having loud phone conversations in the background. Every morning began with a meeting called ‘conference’ – the journalists’ equivalent of scientists’ laboratory meetings. Representatives from the various news desks ran through what their main stories of the day were going to be, before they became ‘news’. At the science desk, I dived straight in. My first published article was a page 3 story on sperm and fertility, complete with a catchy headline. Unfortunately, I can’t take credit for any of the headlines on my articles as these are usually added by the sub-editors. The science writers, including me last month, pitch ideas for stories to the commissioning editor, who in turn pitches the main ideas from the science desk during a daily meeting with other editors. Once an idea is given the greenlight, the article is written and undergoes one or more rounds of editing – including the addition of a headline – before it is filed for publication. To look for ideas, I often used EurekAlert! – an online platform run by AAAS, which collates the newest and most exciting upcoming scientific papers under embargo at various different journals. This gives journalists a heads up, so they can start putting together a news story to be released simultaneously with the paper. During my PhD, I’m training to become an expert in a very specific subject area. 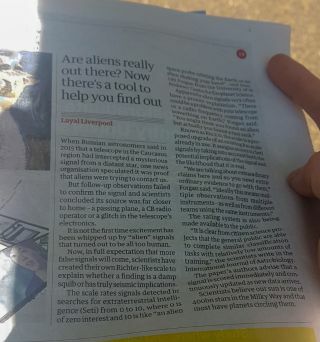 Writing for The Guardian, I suddenly had to broaden my perspective and apply what I had learnt about analysing and interpreting scientific data to subject matters outside my area of expertise. Luckily, I was not alone in this endeavour. None of my articles would have been possible without valuable discussions with the experts in the relevant fields. Much like the scientific process of peer review, getting opinions about new research from one or more independent experts is an essential part of deciding whether something is worth writing about. Something that pleasantly surprised me was how willing and happy scientists were to speak to me about their research and about the work of others, even at short notice. The reputation of The Guardian was certainly helpful in getting responses from busy professors and it was a fantastic privilege to be able to speak directly with world-leading scientific experts on an almost daily basis. Alongside scientific robustness, I learnt that another vital ingredient in good science writing is the hook. A typical response I would get when pitching ideas to the editors was “what’s the top-line?” Summarising a complicated scientific paper in one sentence is a valuable skill, which I will definitely apply as I continue my PhD. As a researcher who has been involved in the process of generating data for the revision of a scientific paper, I thought I was pretty familiar with working to tight deadlines. I could not have been more wrong. During my placement, I quickly learnt how to read scientific papers and write articles within a few hours. To meet deadlines, usually dictated by embargo times set by scientific journals, I also needed to promptly contact and interview the scientists who did the work, as well as independent experts. I discovered that my role as a science writer was to represent my readers rather than scientists. The readers were not there to ask their questions themselves and so it was my job to do this on their behalf. This was a massive responsibility and so asking the right questions was critical. Sometimes, I needed to get comments from people other than scientists too. Scientific research can have far-reaching implications for society. Society, in turn, has a say on how and whether potential applications of scientific research are implemented. I will never forget the first press conference I attended. The Nuffield Council on Bioethics were about to release their comprehensive report on the social and ethical issues surrounding genome editing and reproduction. Sitting beside journalists from various media outlets it occurred to me that more people would read the news stories about the council’s report than would ever leaf through the actual 183-page document. The reporters in the room were tasked with the responsibility of communicating the report’s key messages to a wider audience and igniting an important and necessary public debate. I believe this is a responsibility that scientists should also share. Engaging the public with the (often publicly funded) research that we do is also an important part of our jobs as scientists. I was certainly sad to leave The Guardian science desk at the end of the month, but also extremely grateful for the phenomenal experience I had covering the latest science stories from antibiotics to aliens. My placement was part of a British Science Association Media Fellowship awarded to me earlier in the year, funded by the Society for Applied Microbiology. I would like to thank my PhD supervisor, Jan Rehwinkel, for supporting my application. My PhD is funded by the Wellcome Trust and I am based at the MRC Human Immunology Unit. This article was originally published on the MRC WIMM blog. Available here.